Sakunda Holdings has unveiled a $10 million funding package to kick-start Command Livestock and will also bankroll the production of up to two million chickens per month as the fuel firm maintains its partnership with Government in strategic policy interventions to revive the national economy. The firm’s director, Mr Kudakwashe Tagwirei, urged the private sector to join Government in funding agriculture as it is the backbone of the economy. Mr Tagwirei said this last Thursday during the launch of the Command Livestock, Fisheries and Wildlife attended by Cabinet ministers and captains of industry among others. “From a Sakunda perspective, we want to provide sound funding, we have something which can kick-start the programme, we are thinking of providing about $10 million to kick-start your programme in livestock,” said Mr Tagwirei. The event was attended by Agriculture, Lands and Rural Resettlement Minister Chief Air Marshal Perrance Shiri (Rtd). “Secondly, we also think that we can participate on the poultry side because we believe that Government does not need to give guarantees on that programme because it is a short programme, two months or so. We can be able to assist you as Government in providing the necessary support to do with poultry, maybe up to one million to two million (dollars) a month. That is what we are going to support initially.” He implored other private players to work with Government to support agriculture saying there were downstream benefits. “Let me say to my friends in the industry, if there is a better way of helping this economy to grow it is to support agriculture. 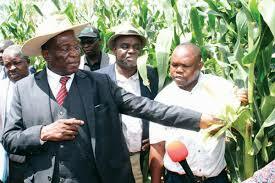 If you do not support agriculture, whatever you might want to embark on will be a futile exercise,” he said. Mr Tagwirei said the participation of his firm in the Command Agriculture had yielded benefits for the country in the form of a bumper grain harvest. “In the last programme, we believe that $200 million went into the economy because farmers were on their farms and as a result of that, a lot of them bought fuel, which is my core business, and that is how the economy grows. I am in the fuel sector, and if you look at it from my side, I am already benefiting on the fuel side because of farmers. Most probably you are also going to benefit in your business, so let us come and support this programme,” said Mr Tagwirei.